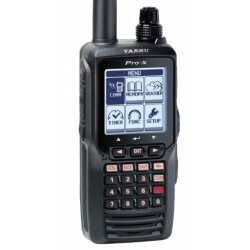 A choice of hand held radios including the new Yaesu range. Your chance to bag this months special offer bundle. Save over £20 on normal pricesThe bundle includ.. THIS RADIO IS NOT AVAILABLE FOR POSTAGE OUTSIDE THE UK. IF YOU ORDER IT, WE WILL REFUND YOU!In respo..
YAESU FTA-550L The YAESU FTA-550L is packed with features, yet very affordable. Boast.. The YAESU FTA-750L Combines tradition with innovation. Born from a history of high quality communic.. The Yaesu SSM-10A Waterproof Speaker Microphone for FTA-250, FTA-550 / FTA-750 fits the Yaesu FTA-55..
Charger Cradle for FTA250/450/550/750. (Requires SAD-11)..
Yaesu SBH-11 Charging Cradle Power Supply..
Yaesu SCU-15 Headset Adaptor CableYaesu SCU-15 Headset Adaptor CableCompatible with 250, 450, 550 an..
YAESU SDD-12 DC CABLE WITH 12V CIGARETTE LIGHTER ADAPTORThe Yaesu SDD-12 DC Cable with 12v Cigarette.. The Yaesu SEP-10A Earphone for use with Yaesu SSM-10A Speaker Microphone. This is very useful for no..
Yaesu SCU-37 USB PC Programming Cable..